Few things seem easier than grilling a skinless, boneless chicken breast. However, grilling a tender, juicy, and flavorful chicken breast can actually be a challenge. Without the chicken's protective skin and because of the uneven thickness, you frequently end up with a dry piece of meat by the time it's done. The good news is that there are a few things you can do to keep this from happening. Pounding it to an even thickness, brining, and grilling it over a high, direct heat will help prevent overdrying. If you do all of these simple things, you will be able to enjoy a moist and delicious chicken breast. When you buy skinless, boneless chicken breasts they have a tapered shape and attached tenderloin. For grilling purposes, it is best to remove the tenderloin. Since it is thin, it will cook far too fast to be any good before the rest of the chicken is finished cooking. To even out the meat, pound it to about 1/2-inch thickness. This will give the breast a uniform thickness and break up the meat, which will allow the brine to permeate the meat quickly. You will find it best to place the chicken between plastic wrap before pounding it. Taking the time to brine poultry is worth it when you want a juicy meat. It's even more important with chicken breasts because they're naturally drier than other pieces of chicken, especially with the skin removed. To brine the chicken, dissolve 1/4 cup (60 mL) of table salt with 1/4 cup (60 mL) of sugar in 4 cups (950 mL) of cold water. This will make enough brine for four chicken breasts. If you are using kosher salt, use 1/3 cup (80 mL) for 4 cups of water. If you are cooking more or fewer breasts, adjust the amount of brine accordingly. The sugar in the brine will caramelize on the surface of the chicken as it cooks, giving it a nice, grilled coloring. To help dissolve the sugar and water, simply add it to 1 cup of boiling water, stir until dissolved and add mixture to the remaining water. Make sure the brine has cooled before adding the chicken. You can brine the chicken in a shallow, covered baking dish or a large zipper bag. Make sure to brine for at least 30 minutes and up to 2 hours. It is important that you give the brine enough time to work, but don't overdo it. At the end of the brining time, remove the chicken breasts and rinse them thoroughly to remove any excess salt. Do not add additional salt to the chicken or it will be too salty in flavor. Season chicken breasts as desired, though, and prepare to grill. 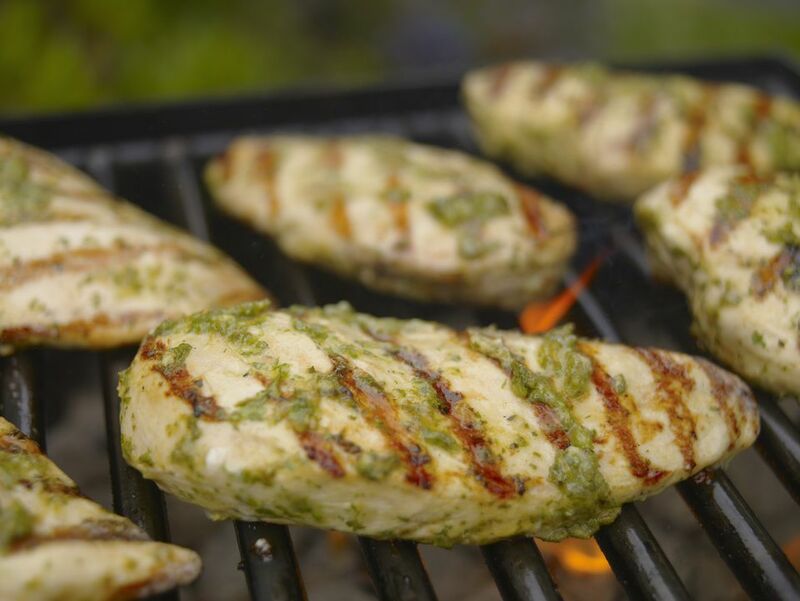 The final secret to fabulous grilled chicken breasts is to cook over direct heat and only direct heat. You also want to avoid overcooking, so timing is very important because of the short cooking time. Follow these tips and you will end up with the perfect chicken breast for any recipe. With the grill hot and the cooking grate lightly oiled, put the chicken over the hottest part of the fire. The total cooking time should be about 4 to 6 minutes. Turn the chicken only once. Leave the lid off the grill if using charcoal or close the lid if using gas.